This week saw some changes being made to the Morgan Motor Company website with the inclusion of new work shot by Ambient Life photographer Tim Wallace for our client Morgan. The material firstly shot for the Geneva Motor Show this year has gone on to be used in numerous marketing campaigns from European magazine advertising to a show in Milan. 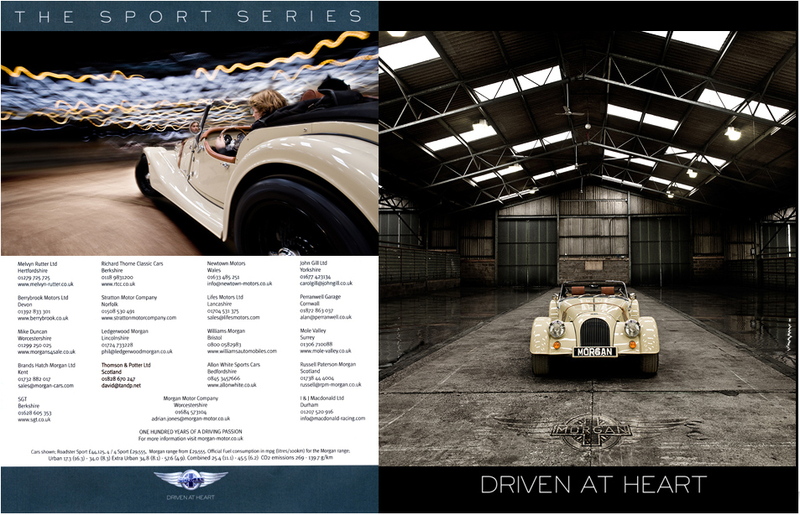 This week saw some changes being made to the Morgan Motor Company website with the inclusion of new work shot by Ambient Life photographer Tim Wallace for our client Morgan. The material firstly shot for the Geneva Motor Show this year has gone on to be used in numerous marketing campaigns from European magazine advertising to a show in Milan, The Milan Design Week. Milan design week is a showcase of the worlds most recent and ground breaking design and saw Morgan alongside other infamous automotive marques. Not solely a car event, designers and companies specialising in furniture, interiors, modern art, fashion, technology, automotive design etc. all exhibit in showrooms in both districts around Milan centre and the centre itself. The event was set off by a huge print of an photograph taken by Photographer Tim Wallace as part of a recent shoot with our client Morgan and can be seen hanging proudly in some of the images below from the event. 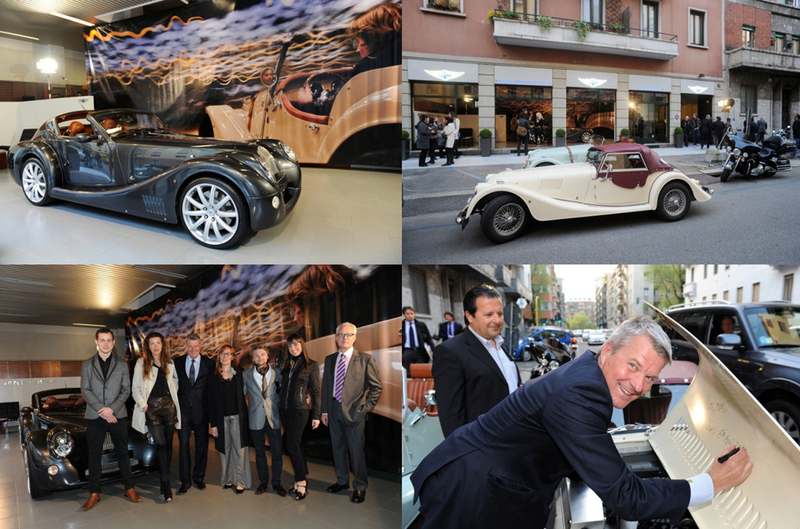 With the enthusiastic support of Luigi Borghi, Morgan Design transformed the Borghi Automobili showroom promoting the brand to the worlds press and customers. Jason Barker in the November issue of EVO " ...if it's a traditional Morgan you've set your heart on and you were wavering since V8 production ended, waver no longer because the V6 model is a worthy successor and a character in it's own right." Autocar "Think Morgan and you think open roads, country lanes and picnics in fields. In that environment the Roadster makes sense. For one it's very quick. Then there's the sound. Get near the 6700 rpm cut-out and 24 valve V6 emits a glorious howl ." Andrew Frankel in the Sunday Times "In the Roadster....by driving smoothly, thinking ahead and understanding the idiosyncrasies of your car, you can go faster, stay safer and at the journey's end experience a sense of pride you'll not find in a modern car that does it all for you....like any Morgan it is built entirely by hand in a factory that first started producing Morgans in 1910. Go there and it is like a time warp- a world of chisels, planes and lathes where cars are lovingly created by the hands of craftsmen, not expertly assembled by the mechanical arms of robots.....it made me feel good.It indulged and involved me in a way that few modern cars could, and while the fun it provided was slightly perverse and mildly masochistic, fun it undoubtedly was." Charles Morgan - "Morgan don't want to be too big for our boots. We will always be a small player, one of the car world's Davids but with the ability to make genuinely interesting coach-built cars".